Keyed OMEGA™ quick couplings are specifically designed for small flexible hose and plastic tubing applications which require positive mechanical connections and non-interchangeable lines. They provide economical, keyed, high reliability, fool proof connections that are compatible with lower pressure and size requirements for instrumentation applications. Warning: Standard thermoplastic and chrome-plated brass quick disconnects cannot be interchanged with keyed quick disconnect couplings because they will leak. 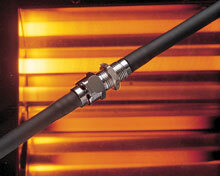 †PTF fittings are designed for semi-rigid tubing i.e. polyethylene, nylon, etc., and polyurethane tubing.